There’s no home theater experience quite like a giant projected screen. TVs get bigger by the year, but once you cross the 65-inch mark, prices increase exponentially – and good luck trying to find a 150-inch TV. For the average person, a projector is the best way to go big. But projectors are also stuck in the past. Most have none of the smart features we’ve come to expect from our TVs, acting simply as displays for our cable boxes and streaming devices. The ones that are smart tend to be of the small, portable variety – not really meant for extended home use. Optoma’s UHL55 tries to bridge that gap. It’s a $1,400 4K projector running Android with support for Amazon Alexa and Google Assistant control. 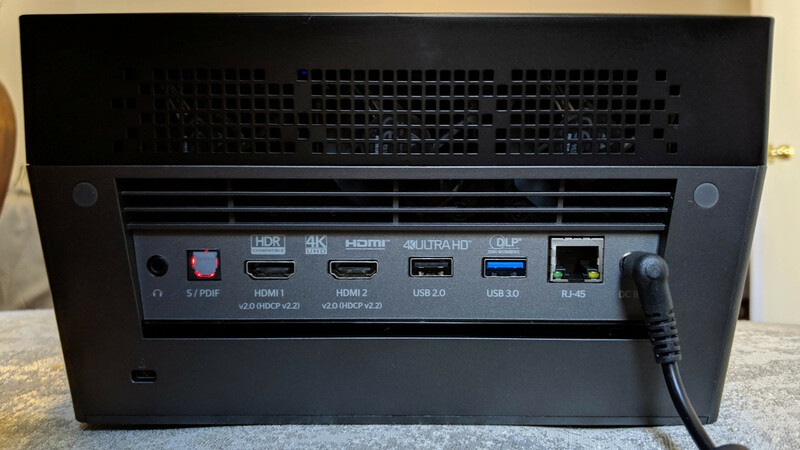 So here’s the TL;DR for this review: the UHL55 is a really nice projector with poor software… but that’s still more software than its competition. Google Assistant and Amazon Alexa support. There’s a lot packed into a relatively small chassis. The UHL55 isn’t a portable projector, but it’s still smaller than most 4K options for the price. It comes in at 8 pounds and is easy to move around where you need it. Setting it up is straightforward. I opted to keep it on a table during testing, so it was just a matter of finding an empty wall and setting the adjustable feet to the proper height. Once turned on and set up, you’ll notice the biggest issue with the projector. It isn’t running Android TV… it’s a very basic, highly skinned version of Android 6.0. That means no native Chromecast support. It means no access to the Play Store. It means many apps you try to sideload (done via USB) will be broken. Apps that do work might behave in a wonky manner. There were exactly nice apps available when I tested it, which is even worse than similar ‘Android but not Android TV’ projectors like the Anker Nebula Mars. Of those apps, the only ones I really cared about were YouTube and Netflix. The Netflix app was the phone version of the app and it sometimes wouldn’t respond when I tried to navigate around with the remote. To any manufacturers looking to implement Android on their projectors… please use Android TV instead. I know it’s probably more work, but it’s a far more pleasant user experience. 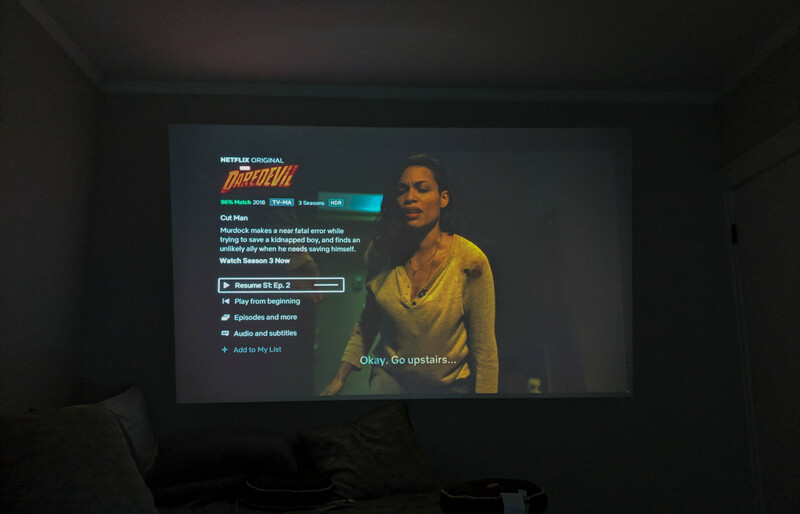 In the meantime, if you’re considering this projector, do yourself a favor and connect a streaming dongle like a Chromecast or Roku. The projector’s saving grace is that its USB port provides enough juice to power such devices without the need for an additional power brick. It’s a relatively clutter-free situation. Otherwise, the UHL55’s Android implementation is only really useful for loading files from a USB stick and the occasional app. The other part of the ‘smart’ equation is support for Google Assistant and Amazon Alexa. Now this, I can get behind. Setting it up requires you to create an Optoma account and link it to your Google Assistant or Amazon Alexa account (which is a bit more complicated than it needs to be). Once that’s done, you can tell the projector to perform a variety of actions, including changing the volume, turning it on and off, changing the input, controlling playback, etc. It’s a surprisingly robust amount of control, and it mostly worked without a hitch. Keep in mind I’ve read some complaints online about the consistency of this feature, but I seem to have lucked out with my unit’s performance. Perhaps Optoma had cleaned up its software by the time I got around to reviewing it. 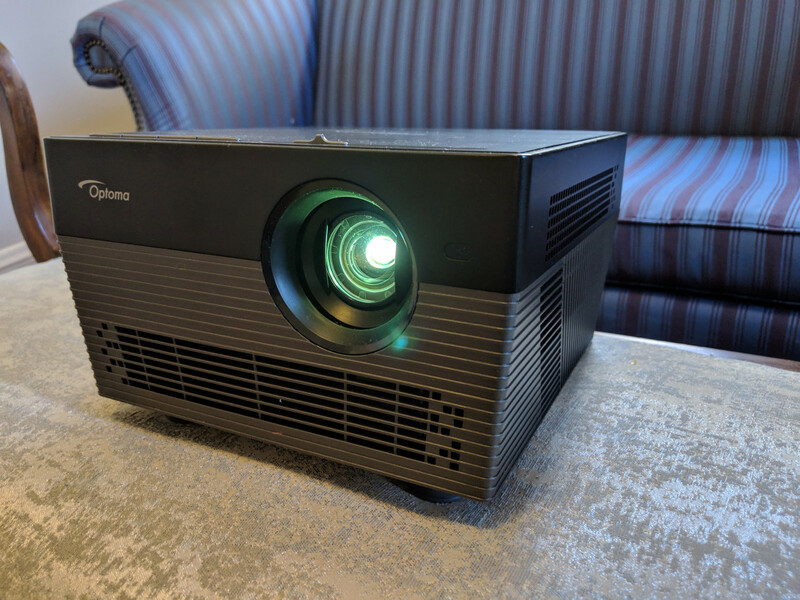 Home theater isn’t my area of expertise, so I won’t go into much detail regarding the image quality other than to say that I thought the overall performance in a dark room was impressive, especially if this is your first foray into projectors. I only projected it onto white walls and was pleased with the resolution and colors with both standard and HDR content. Even 1080p content looked good thanks to some solid upscaling. You’ve probably heard by now that 4K isn’t necessary unless you’re sitting really close to a display or have a massive TV. Well, when projecting a 150-inch image, those extra pixels are certainly welcome – it made me appreciate 4K content a lot more than I normally can on my measly 55-inch TV. Though the UHL55 uses pixel shifting technology to achieve its 4K resolution, the image is razor-sharp, even at the corners. The lack of a zoom lens may help in that regard. Completing the home theater experience are the speakers, tuned by Optoma’s NuForce audio team. I normally don’t expect much from projector speakers, but I was pleasantly surprised with the UHL55 – it’s better than the built-in speakers on some TVs, with a decent amount of kick and volume. You can use the UHL55 as a Bluetooth speaker, and inconvenient as it may be, it does a pretty sweet job in a pinch. It’s worth noting that since the UHL55 uses an LED light, the contrast isn’t quite as good as more a traditional lamp-based projector, but the flip side is that its estimated longevity is far better: 20,000 – 30,000 hours (depending on your brightness mode), compared to just 4,000 to 10,000 on one of Optoma’s own lamp-based projectors. Traditional projector lamps also tend to slightly change color and brightness over time. Pick your poison. This smartphone photo doesn’t really do the projector’s excellent resolution and colors justice, but you can see that the contrast isn’t ideal. I have but two real caveats with the image quality. One, if you’re projecting a large image, the 1,500 Lumens rating won’t do you much good in the daytime. I found I had to go down to something closer to 65 inches for something I’d be satisfied in a decently-lit room. Two… input lag performance isn’t great, so this won’t be your first choice for gaming. Optoma claims an input lag of 70ms when in Game Mode, which is too high for any sort of competitive gaming, though fine for most other titles. However, the input lag seems to be significantly higher from lower resolution sources. The UHL55 exhibited more input lag with my Nintendo Switch connected than it did from 4K sources, even in game mode. I’d assume this is because of resolution upscaling, which I found no way to disable. Most 4K projectors have lackluster gaming performance, but it’s something to keep in mind nevertheless. Hopefully, this is something the company can resolve with a firmware update. My impressions might come off as mixed, but I quite like this little projector. I’m baffled by the Android implementation and I wish it were brighter, but the fact remains that it’s one of the only projectors with its particular combination of features. The image quality is really good, voice control is neat, and I’d rather have a wonky version of Android than no version at all, as long as it gets the job done. The question then becomes whether it’s worth the money. For around $1,400, you can find plenty of other 4K projectors that provide a brighter image or more contrast. There’s Optoma’s own UHD50, BenQ’s HT2550 and TK800, and Viewsonic’s PX727, to name a few. If you’re willing to spend $1,700, Optoma’s UHD51A supports Alexa and Google Assistant too, just without Android. But these don’t provide the UHL55’s flexibility, potential for upgrades, Bluetooth capabilities, or LED longevity. It may not be as smart as it should be, but at the very least, it gets points for originality. Let’s hope the next version comes with Android TV.